This page is about the medium tank AMX-30B2. For other uses, see AMX-30 (Family). The AMX-30B2 is a Rank VI French medium tank with a battle rating of 8.3 (AB/RB/SB). It was introduced in Update 1.75 "La Résistance". The vehicle follows the conventional western tank design of the mid Cold War with four crew members and a 105 mm gun. It has good armour on the UFP that can bounce some weaker shells but the sides, rear and top are very weak, making the vehicle highly vulnerable to air attacks and SPAA fire even from a distance. It has good acceleration, mobility, and firepower. 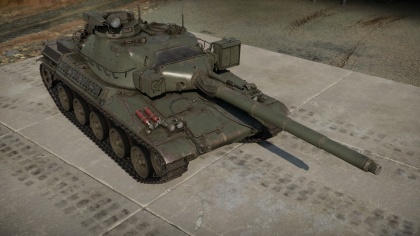 Its turret resembles that of the T-54 series from the sides due to its rounded shape, so be careful in SB and check twice before firing at this tank because you may hit your ally if you do not pay enough attention... This can prove both to be an up and a downside depending on who's actually making the mistake. This vehicle has the particularity to throw the usual 7.62 or .50 co-axial MG away for a powerful rapid firing 20 mm autocanon that can be elevated up to 40° that fires HEIT and APIT projectiles with a penetration up to 40 mm at close range and against straight armor. This weapon is very useful to deal with light ennemy tanks that are rushing you since this gun will simply wreck them, especially if they show their flanks. This gun is also very effective at taking down attacking aircraft that would be crazy enough to rush straight at you or pass you by at low altitude and low speed. At last, this gun can destroy walls, trees and every obstacles you may encounter. 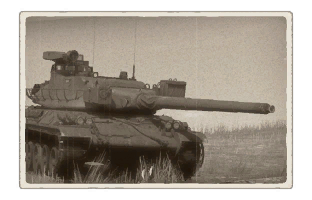 The AMX-30B2 also has an unmatched firepower at it's BR. Its 105 mm gun fires both the OCC 105 G1 shell found on the first AMX-30, but also the dreaded and powerful OFL 105 F1 which is nothing less than the most powerful APFSDS shell in the BR bracket. This shell and the lack of a stabilizer simply tells you all about this tank, just like in real life where it used it's superior detection and acquisition devices to engage and destroy targets from afar, you should simply do the same in the game by staying back and supporting your team from afar using your laser rangefinder and your powerful APFSDS to outrange and delete enemies from a distance. Ammo racks of the AMX-30B2. French AMX-30B2 needs to be played more carefully than its other NATO counterparts such as the M60A1 (A0S) or the Leopard A1A1 due to the lack of a stabilizer, hence making firing on the move and/or after short stop more risky than if you were playing a T-62 in the case of a sudden frontal encounter. As a result the French AMX-30B2 is the best played as a second line support tank, a long range sniper or a flanker. You cannot expect to drive straight into battle and come out victorious in this tank. This tank is, above everything, a sniper tank. The lack of a stabilizer will restrict your playstyle on most city or clustered maps. In these kinds of environment, you will have to play much more slowly and carefully than the other tanks because most tanks amongst other nations come with a stabilizer such as the Cheiftain, the T-62 or the T-10M. Just advance slowly and try to be as much aware of your surroundings as you can be because this will prove to be a real life saver in this kind of environment. You can also simply lay ambushes to your enemy by patiently waiting for someone to come in front of your gun, destroy this enemy and quickly relocate using the tank's good mobility. On big maps however, this tank can unleash all of its potential as the lack of a stabilizer won't be a problem on big maps, find a good location with a clear line-of-sight of commonly used routes to the capture zones and use the binoculars as well as the laser rangefinder to snipe your enemies from long distance, they simply wont be able to return fire soon or well enough before a final blow (if it's not done already) achieved through a AMX-30B2's perfectly ranged and aimed shot. To sum it short, this tank plays very differently than other MBTS from all nations. It's not as versatile or flexible as other vehicles, but is extremely good at what it does the best due to top notch gun and ammunition as well as range-finding device. In terms of enemies: every stabilized tank can prove extremely dangerous to you in CQC. Also due to your lack of armour, any tank you can encounter in your BR bracket can and will penetrate you frontally if they lay their gun on you. The best method is often to avoid direct combat or, if you have to do it, make sure that you will do it where you'll have the advantage also known as range. German cannon CAS is also the bane of this tank due to its very thin roof armour. If a player decides to hop into their Me 262 A1/U4 for a payback, it'd be very wise to find a hard cover or a very dense forest in the next 30 seconds because 30 and/or 30 mm canons loaded with AP shells will be on their way with the AMX-30B2 as a priority target. Very powerful 105 mm APFSDS. Coaxial 20 mm autocannon with 40° of elevation to deal with thinly armoured vehicles and CAS aircrafts. 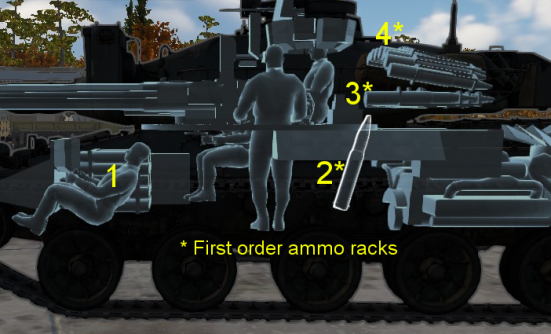 Good survivability when being hit in the turret front as the massive 105 breech and the 20 mm breech will absorb a lot of damages. Smoke shells and grenades are available. Average -8 degree gun depression. Laser rangefinder being a great help to snipe over long distances accurately. No stabilizers, which restricts the play style of the vehicle. Inadequate hull armour against other Rank VI vehicles. 15-20 mm roof armour can be exploited by aerial attacks. high cupola that can be exploited by enemies when behind a cover. Describe the history of the creation and combat usage of the ground vehicle in more detail than in the introduction. If the historical reference turns out to be too big, take it to a separate article, taking a link to the article about the vehicle and adding a block "/ History" (example: https://wiki.warthunder.com/(Vehicle-name)/History) and add a link to it here using the main template. Be sure to reference text and sources by using <ref>, as well as adding them at the end of the article. This section may also include the vehicle's dev blog entry (if applicable) and the in-game encyclopedia description (under === Encyclopedia Info ===, also if applicable). Skins and camouflages for the AMX-30B2 from live.warthunder.com. This page was last edited on 29 March 2019, at 16:29.